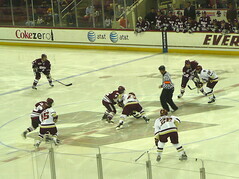 Later this afternoon, J and I are going to Boston College for a men’s hockey game. J and I used to be in the habit of going to Bruins games on Black Friday, as the Bruins typically have a matinee home game the day after Thanksgiving, when both J and I are off work. 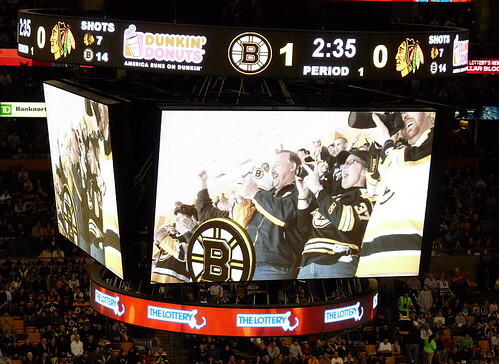 After the Bruins won the Stanley Cup in 2011, however, their ticket prices skyrocketed, so now we go to far fewer professional hockey games. Fortunately, Boston College is within (healthy) walking distance of our house, and BC hasn’t raised ticket prices after winning three national championships in the past five years. Attending a college hockey game is a different, more “family friendly,” experience than attending a professional hockey game. There’s no alcohol served at college games, so you’re far less likely to sit next to drunk and rowdy fans; instead, BC hockey games tend to attract parents shepherding flocks of hockey-crazy kids whose hooligan antics are more likely fueled by sugar and pent-up energy than anything alcoholic. On the ice, college hockey games feature far fewer fights than in the pros: although the competition gets just as heated, college players who fight get tossed from the game rather than simply spending five minutes in the penalty box. As much as I appreciate the unwritten rules of professional hockey fights, I also appreciate the calmer, more “focused” energy apparent at college hockey games. At a professional game, you get the sense that a good number of the fans are more interested in drinking and watching fights than they are in following the actual game. 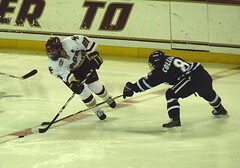 At college hockey games, on the other hand, you’ll often encounter hockey parents who use the game as a teachable moment, coaching their kids on how to apply in their own games the techniques they see on the ice. 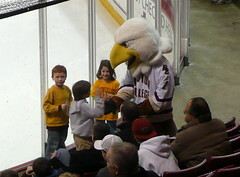 BC’s mascot, Baldwin, also apparently sees home hockey games as a good change to mingle with young hockey fans, both on and off the ice. On a day typically devoted to shopping outings that occasionally turn violent, it seems downright wholesome to spend the afternoon watching a fierce but family-friendly competition that ends in handshakes. 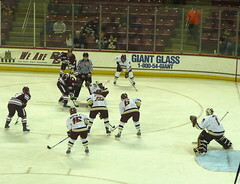 The photos illustrating today’s post come from a February, 2009 game against the University of Massachusetts. 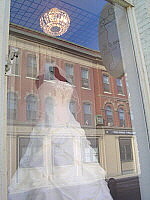 This is my Day 29 contribution to NaBloPoMo, or National Blog Posting Month, a commitment to post every day during the month of November: thirty days, thirty posts. 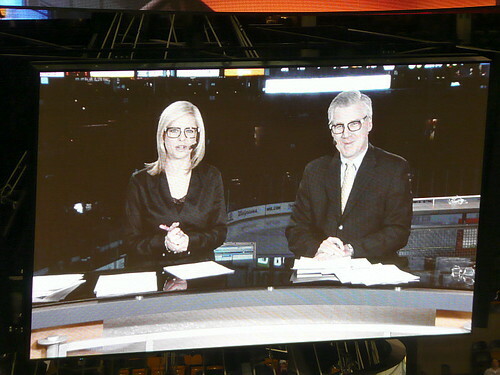 J and I joke about the number of face-off shots we each take at any given hockey game. 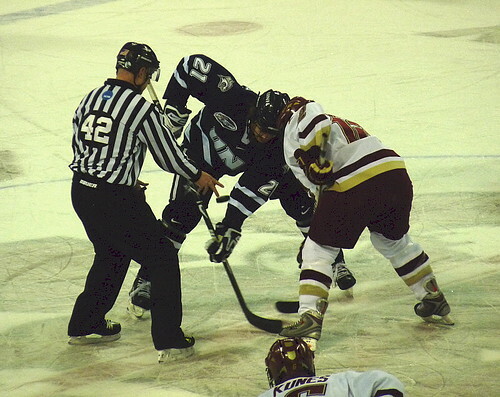 After a penalty call or other stoppage in play, the face-off offers one still moment when players from both teams line up, face-to-face, waiting for the linesman to drop the puck. 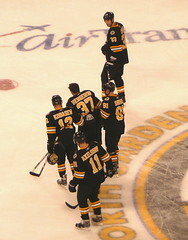 It’s a easy photographic shot because the players and linesman are all standing still. 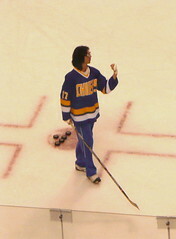 As soon as the puck drops, though, players scatter like quicksilver on ice as one team gains possession of the puck and the other team switches into defensive mode. As easy as face-offs might be to shoot in theory, I tend to snap my shutter too early or too late. 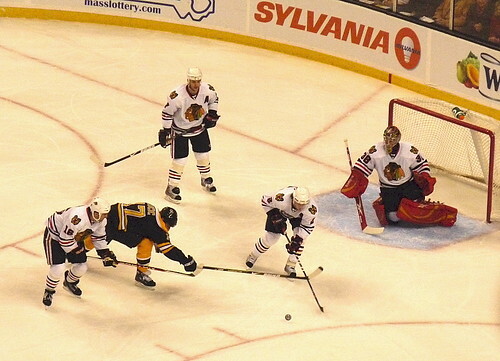 If you shoot a face-off too early, some players won’t be in position or the linesman will be standing, not yet crouching with the puck at ready. If you shoot a face-off too late, the players have already darted off and you’re left with an image of empty ice where neatly aligned players used to be. The magical moment in a face-off is that split second after the linesman drops the puck and before it actually touches the ice. 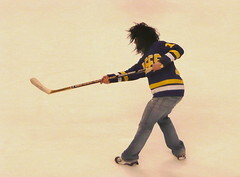 A puck in mid-drop is the ultimate freeze-frame: the illusion of time standing still. This weekend I find myself wishing life had a shutter-button you could snap to stop the drop of time’s puck in mid-air: a face-off, frozen. This week marks the end of one online teaching term and the immediate start of another, and I’m juggling end-term grading with the midterm paper-crunch from my face-to-face classes. 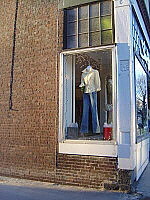 When life gets busy, I find myself wishing I could hone my reflexes to freeze life at one still moment were I could squeeze more productive hours out of any given day: right here, right now, stop! 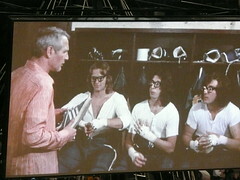 Instead, time skates by like a lightning blur, never stopping for any linesman’s whistle. Life moves at the speed of quicksilver on ice, and only the eagle-eyed can spot the split-seconds of tranquility in its smooth passing. 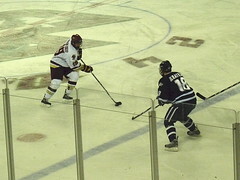 Click here for the complete set of photos from last weekend’s hockey match-up between Boston College and the University of New Hampshire. 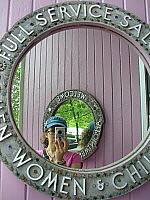 It tells you something about the speed of life these days that I’m only now getting around to blogging photos from last weekend. As much as J and I have enjoyed the half dozen Boston Bruins games we’ve already attended this year, there’s something refreshing about watching a good college hockey team. 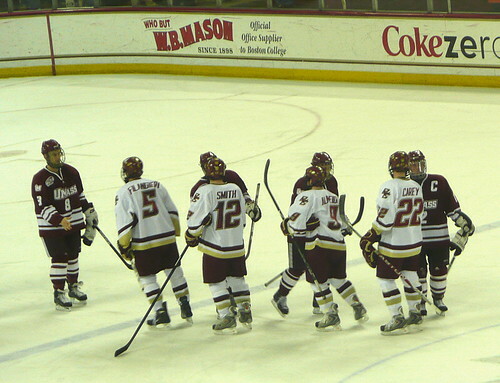 When we walked to Boston College for a men’s hockey game against Northeastern last year, I noted some of the differences between college and professional hockey. 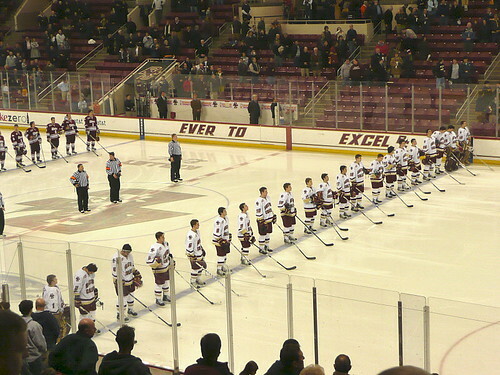 Boston College doesn’t serve beer at athletic events, so fans don’t come to get drunk. 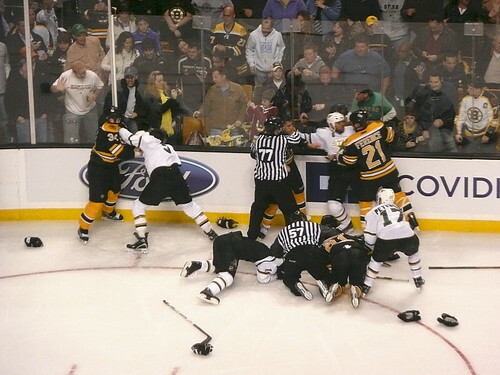 College referees strictly enforce rules against rough-housing, so fans don’t come to watch hockey fights. 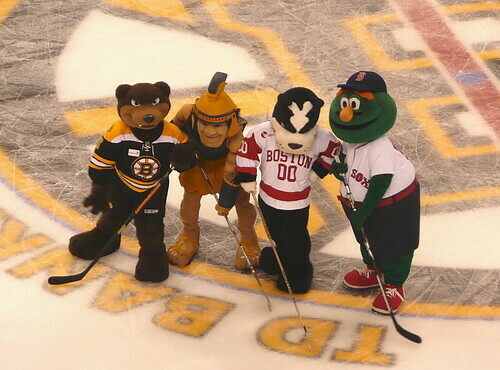 And although the BC pep band and mascot “Baldwin” are on hand to keep fans entertained, there are no Ice Girls. Fans at a college hockey game, in other words, are actually there to watch the game, which is a refreshing phenomenon in a town where championship-winning professional sports teams attract a lot of “bandwagon” fans who sit chatting or texting on their cell phones, clearly oblivious to the game. 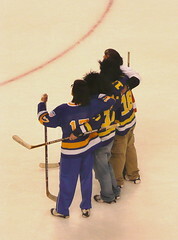 This is my belated contribution to last week’s Photo Friday theme, The Team. 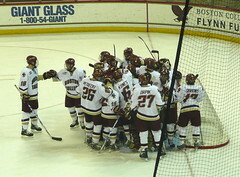 Click here for more pictures from Friday night’s Boston College men’s hockey game. Enjoy! 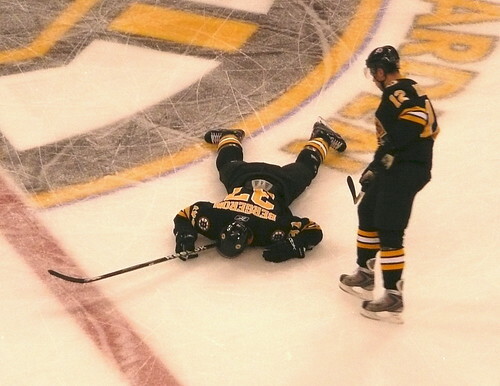 It’s a sight no one playing on or rooting for either team wants to see: a lone hockey player lying face-down, unmoving, long after play has continued down ice. 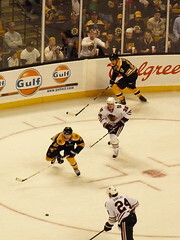 At yesterday’s Boston Bruins game against the Carolina Hurricanes, Patrice Bergeron collided with opposing defenseman Dennis Seidenberg and lay on the ice for a heart-stopping handful of minutes while fans and players alike were silenced, holding our collective breath while watching for any sign of movement. 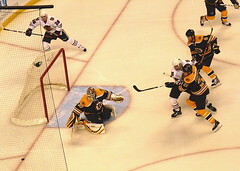 During that heart-stopping handful of minutes we all watched Bergeron’s lifeless body, I flashed through other heart-stopping Boston sports moments: the face-first slam against the boards that took Bergeron out for an entire season last October, for example, or the heartbreaking moment in 1995, when Travis Roy was paralyzed from the neck down only 11 seconds into his Boston University hockey career. 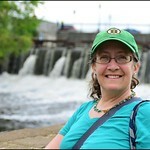 Outside hockey, there’s the image of Celtics captain Reggie Lewis collapsing during an off-season basketball practice in 1993, dead from a sudden heart-attack at the age of 27. Sports fans thrill at the sight of honed bodies performing at their best; we don’t expect the young and strong to fall victim to the random vicissitudes of injury or accident. 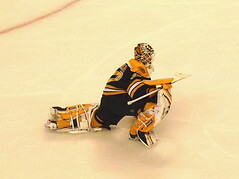 Travis Roy (just like Superman!) 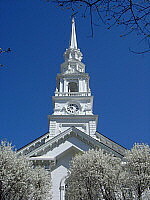 went on to establish a charitable foundation for victims of spinal cord injuries, there is an inner-city track and athletic complex commemorating Reggie Lewis, and Patrice Bergeron eventually regained consciousness, slowly regained his feet, and skated off the ice with the help of a handful of teammates. There is, in other words, hope after any one of us–young or old, strong or weak, in shape or out–suffers injury or accident. In Zen, we say “fall down six times, get up seven”: it’s not about never failing, but always getting up to try again, and again, and again…somehow. You can’t keep a tough player down, especially if he has an entire team of friends helping him to his feet again, and that applies both on and off the ice, in hockey and beyond.